Osmosis: Osteoporosis medications. (2019, April 20). 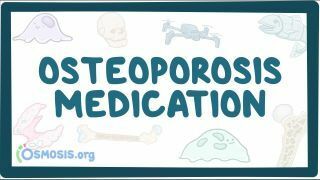 Retrieved from (https://www.osmosis.org/learn/Osteoporosis_medications). Alendronic acid (trade name Fosamax) is a bisphosphonate drug used for osteoporosis, osteogenesis imperfecta, and several other bone diseases. It is marketed alone as well as in combination with vitamin D (2,800 IU and 5,600 IU, under the name Fosamax+D). What is the MOA of Bisphosphonates (Alendronate; -dronate)?